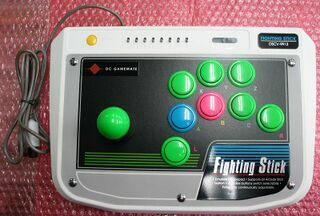 The Fighting Stick, released by an unknown third-party manufacturer for the Sega Dreamcast, is a retooled version of the Sega Saturn Virtua Stick model HSS-0136. The Fighting Stick is a very cheaply made device, simply taking existing HSS-0136 sticks and adding an internal Sega Saturn to Dreamcast controller adapter to make it compatible with the Dreamcast. New foil lables were then stuck over the old branding.